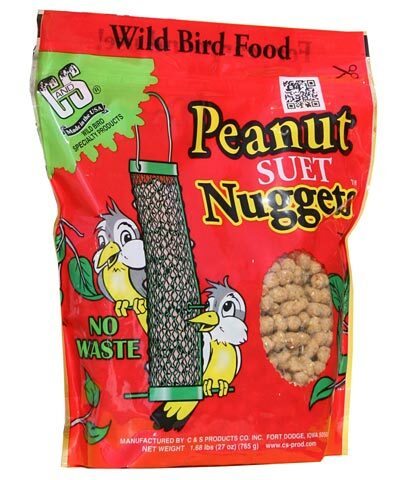 Let the C&S Peanut Nuggets introduce you to a whole new way of feeding wild birds. These "Nuggets" are soft bits of suet, a high-energy formulation of animal fat traditionally used to attract birds which do not normally use feeders. This dynamic variety has peanuts within its mix, and is perfect for birds which love nuts, such as juncos, nuthatches, and woodpeckers. Suet is a great alternative to seed feeding and can attract a wide variety of birds, or only a select few if using specific flavors. Unlike traditional suet, which is produced as a cake, Nuggets can be readily used in traditional feeders when mixed with seed. These Peanut Nuggets offer a no-waste feeding system and a tasty alternative for nut loving birds. Made in the USA. Note: This case pack includes 6 bags of the C&S Peanut Nuggets, 27 ounces each.